The idea that humans must eat animal flesh (red meat, fish, chicken…it’s all meat) to obtain protein is a myth. It is also a myth that animal flesh is the only source of quality protein. All proteins must be broken down into usable amino acids. We can save energy by providing the body with amino acids rather than complex protein chains, like those found in animal products. 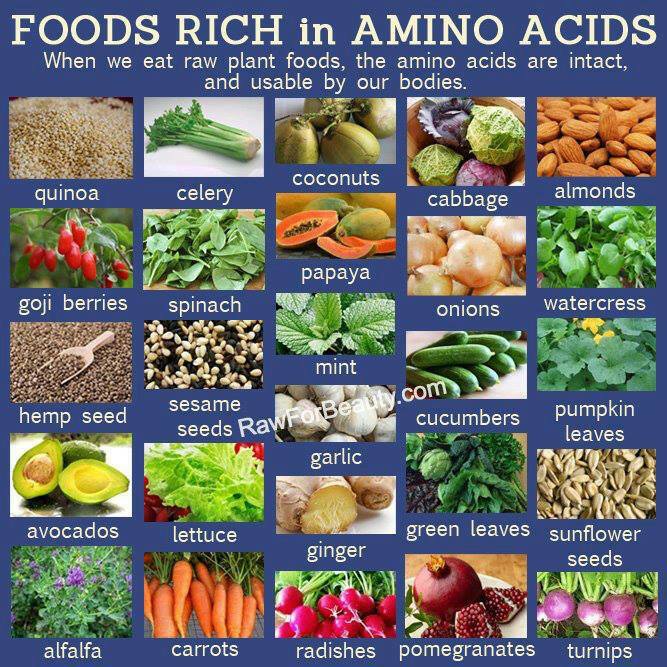 Not only are foods high in amino acids more readily available for the body to use, which saves energy, they typically are less expensive too. Consider the cost of a head of lettuce compared to the cost of a steak. An additional cost savings is to your health. You don’t get heart disease and clogged arteries eating a salad but you do get useful protein. 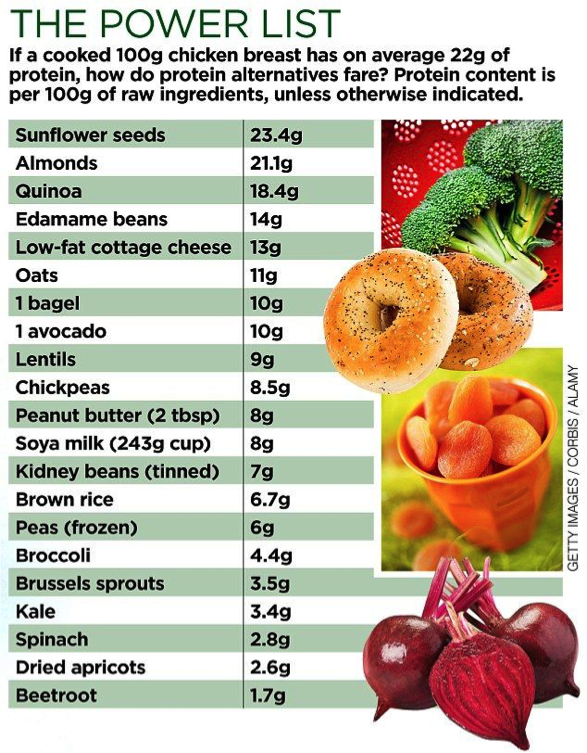 Consider this when you are debating where to get healthy nutrients. 1. Phenylalanine elevates the mood by stimulating the nervous system and may be important to staying motivated. It aids memory and, together with its derivative glutamine, is considered a smart-vitamin (though they aren’t vitamins). It increases levels of epinephrine, norepinephrine, and dopamine in the anterior pituitary. All three are important neurotransmitters needed for optimum operation of the nervous system. Phenylalanine helps the absorption of UV rays in sunlight, which in turn gives a higher rate of vitamin D3. Its main metabolite is tyrosine, which increases levels of dopamine and norepinephrine, as stated above. It’s also one of the manufacturers of glutamine, the amino acid that makes up the largest part of the amino acid pool. Phenylalanine often gets a bad wrap in the press. It is used as a non-carbohydrate sweetener in many soft drinks (combined with aspartic acid, as aspartame) and made headlines recently when some claimed it was hazardous to the brain, and then later it was linked to carcinogenic risk. Toxic levels of phenylalanine can indeed be lethal, but trust me, so can drinking too much water. Phenylalanine is an essential amino acid, and most nutritionists will tell you that you are more likely to be deficient than run the risk of overdosing. Toxic doses exceed 3 to 4 times the amount you would get on average from a diet containing 250-300 grams of protein daily. Phenylalanine can be found in seaweed, spirulina, watercress, pumpkin leaves, horseradish tree (the leafy tips), kidney beans, spinach, turnip greens, skunk cabbage, broccoli raab, swiss chard, amaranth leaves, cottonseed, sesame seeds, sunflower seeds, pigeon peas, lupin seeds, soy, whole grains, peanuts, almonds, rice, avocados, apricots, bananas, raisins, peaches, plums, figs, persimmons, oranges, dates, pears, grapefruit, elderberries, apples, star fruit, and ripe olives. 2. Valine is a branched chain amino acid that helps grow and repair muscle tissue. It maintains nitrogen balance and preserves the use of glucose. Valine can be found in seaweed, spirulina, watercress, mushrooms, horseradish tree (leafy tips), pumpkin leaves, snow peas, snap peas, turnip greens, kidney beans, spinach, skunk cabbage, broccoli raab, sunflower seed, sesame seed, cottonseed, soy, peanuts, whole grains, rice, bananas, peaches, figs, apricots, avocados, guavas, raisins, dates, pears, apples, persimmons, kiwi, cranberries, ripe olives, blueberries, and oranges. 3. Threonine is an essential amino acid that is not manufactured within the body, ever. It is found in heart, skeletal muscle, and nerve tissue in the central nervous system. Threonine is used to form the body’s two most important binding substances, collagen and elastin. It is also essential to maintain proper protein balance. It is involved in liver function, lipotropic functions (when combined with aspartic acid and methionine), and maintaining the immune system by producing antibodies and promoting growth and activity of the thymus. Threonine’s most useful property of all is that it allows better absorption of other nutrients, so protein sources containing threonine are more bioavailable than others. Threonine can be found in watercress, seaweed, spirulina, pumpkin leaves, spinach, skunk cabbage, horseradish tree (leafy tips), turnip greens, kidney beans, soybeans, alfalfa seeds, sesame seeds, sunflower seeds, soy, wheat, some nuts, rice, peaches, apricots, bananas, guavas, figs, avocados, raisins, pears, and dates. 4. Tryptophan helps fight depression and is converted into serotonin and niacin. Contrary to popular belief, turkey has the same amount of tryptophan as other meats. Any drowsiness you experience after eating turkey more likely has to do with your consumption of carbohydrates along with it. Most seeds, beans, and seaweeds have up to three times more tryptophan than turkey. You can find tryptophan in oat bran, seaweed, spirulina, spinach, watercress, soybeans, horseradish tree (leafy tips) pumpkin leaves, mushrooms, broccoli and broccoli raab, turnip greens, parsley, spinach, winged bean tubers and leaves, mustard greens, asparagus, beet greens, mung beans, kidney beans, bamboo shoots, lettuce (red leaf, butterhead, iceberg), amaranth leaves, chicory greens, cauliflower, Chinese cabbage, chives, kale, taro leaves, zucchini, radicchio, kelp, collards, Brussels sprouts, navy beans, pinto beans, swiss chard, lima beans, hearts of palm, broad beans, savoy cabbage, green and red peppers, okra, turnips, winter squash, onions, green and yellow snap beans, celery, cucumber, some hot chili peppers, radishes, tomatoes, potatoes, pumpkin, green peas, garlic, corn, sesame seeds, cottonseed, sunflower seed, chia seeds, peanuts, rice, apricots, raisins, avocados, apples, plums persimmons, guavas, figs, kiwi, dates, oranges, and peaches. 5. Methionine assists in the breakdown and use of fats, which in turn yields a higher testosterone rate. It also eliminates excess fat from the bloodstream, resulting in less potential adipose (fat) tissue. Methionine is key in digestion and the removal of heavy metals from the stomach and liver. It is a good anti-oxidant because it readily supplies sulfur, inactivates free radicals, and helps with memory recall. It is a precursor to cysteine that produces glutathione to detoxify the liver. It is also one of the three amino acids that are needed to manufacture creatine monohydrate within the body, an essential compound for energy production and muscle growth. A deficiency can cause dementia, fatty liver, slow growth, weakness, skin lesions, and edema. Methionine can be found in seaweed, spirulina, sesame seeds, whole wheat, rice, peaches, avocados, figs, oranges, kiwi, pears, grapes, raisins, apricots, plantains, guavas, plums, blueberries, cantaloupe, ripe olives, and persimmons. 6. Leucine is a branched chain amino acid that is responsible for the regulation of blood-sugar levels and the growth and repair of tissues in skin, bones, and skeletal muscle. It’s a strong potentiator to Human Growth Hormone (HGH). It helps in healing wounds, regulating energy, and assists in preventing the breakdown of muscle tissue. Leucine can be found in seaweed, spirulina, pumpkin leaves, watercress, horseradish tree (leafy tips), alfalfa seeds, turnip greens, kidney beans, sesame seed, sunflower seeds, soy, peanuts, rice, bananas, apricots, peaches, guavas, avocados, figs, persimmons, raisins, pears, dates, apples, kiwi, olives, and blueberries. 7. Isoleucine is a branched chain amino acid and is very similar to leucine in many ways. Isoleucine promotes muscle recovery, regulates the blood-sugar levels and stimulates HGH release. But isoleucine holds its own in terms of wound healing. It helps in the formation of hemoglobin and is strongly involved in the formation of blood clots, the body’s primary defense against infection through open wounds. Isoleucine can be found in seaweed, spirulina, watercress, pumpkin leaves, Swiss chard, Chinese cabbage, horseradish tree (the leafy tips), spinach, kidney beans, alfalfa seeds, sunflower seeds, sesame seeds, soy, baking yeast, wheat, almonds, rice, bananas, apricots, peaches, avocados, persimmons, dates, kiwi, apples, oranges, cranberries, blueberries, and plantains. 8. Lysine is very important for growth and development. It is used in the body for calcium absorption, which results in bone and muscle growth, as well as fat mobilization for energy uses. Lysine maintains nitrogen balance and helps to maintain lean body mass in periods of extreme stress and fatigue. It is also needed to produce antibodies, hormones, such as GH, testosterone, insulin, enzymes, collagen, and is used to repair damaged tissue, much like histidine and most of the essential amino acids. It also helps to build new muscle protein. Cardiovascular benefits include the maintenance of healthy blood vessels. Deficiencies in lysine may lead to enzyme disorders, lack of energy, hair loss, weight loss, no appetite and loss of concentration. Lysine can be found in watercress, seaweed, spirulina, parsley, soy, wheat, buckwheat, amaranth, apricots, bananas, tamarind, avocados, peaches, guavas, dates, oranges, pears, plantains, plums, and watermelon. 9. Histidine is needed for the growth and repair of tissue of all kind. It plays a key role in the maintenance and manufacture of glial nerve cells called oligo-dendrocytes that wrap themselves around your nerves to form a protective sheath called myelin. This prevents unintended impulses that can lead to serious defects in the brain and spinal cord. Histidine is also a manufacturer of both red and white blood cells. It helps in radiation protection and removing excess heavy metals (such as iron) from the body. In the stomach, it produces gastric juices that may speed up and improve digestion, so it’s a helpful tool in fighting indigestion and gastro-intestinal disorders. Histidine is a precursor to the non-essential amino acid histamine, which is released by the immune system as a response to allergic reactions. It has also been linked in recent studies to longer orgasms and better sexual enjoyment. Histidine can be found in seaweed, spirulina, soy, black beans, lentils, almonds, cashews, pistachios, walnuts, pumpkin seeds, sunflowers seeds, amaranth, quinoa, rice, broccoli, carrots, kale, romaine, tomatoes, apples, bananas, oranges, and strawberries. Alanine removes muscle tissue breakdown and toxins so the liver is able to metabolize and eliminate them from the body. Alanine may also help to keep cholesterol levels in check. Arginine is more important when you’re young and can be synthesized in a healthy body. It has amazing nitrogen retention ability, which is a key element in muscle protein synthesis. It enhances the immune system and stimulates the size and activity of the thymus gland, which is responsible for the famous “T-cells.” The hormonal release properties include releasing insulin from the pancreas and a massive stimulator in the manufacture of GH from the anterior pituitary. The metabolite arginine pyroglutamate allows it to pass the brain-blood barrier more easily. But mostly it facilitates muscle mass gain while limiting fat storage, because it keeps fat alive in the system and uses it. Asparagine is a requirement in amino acid transformation. It helps the nervous system maintain its equilibrium, acts as a detoxifier in the system, and regulates metabolism. Aspartic acid is similar to asparagine in helping elevate metabolic levels. Due to its effect on cellular energy, it is sometimes used to combat fatigue and depression. Aspartic acid also acts as a synthesizer for other amino acids. Cysteine, like alanine, acts as a detoxifier due to its sulfur content. It is required for healthy skin because it removes free radicals and produces collagen (used for skin elasticity and texture). Cysteine is the manufacturer of taurine, which is a component of glutathione. Glutathione, in turn, protects the brain and liver from damage by way of drugs, alcohol and other substances the body considers harmful. Glutamine is a non-essential amino acid that is present in the body in large amounts. It forms 60% of your total amino acid pool. It passes through the blood-brain barrier rather easily so it is often called “brainfood.” It aids memory recall and concentration. In the brain, it converts to glutamic acid, which is essential for brain functioning and increases gamma-amino-butyric-acid (GABA), which is another popular supplemented amino needed for mental activities. It is also used in synthesis of muscle-tissue. Glutamine helps to get rid of excess nitrogen by attaching to it and forming glutamic acid and carrying it out of the body. Glutamine is also one of the main building blocks in our genetic code. And most important perhaps is that it balances acid/alkaline levels, so it reduces lactic acid. Glycine is a glucogenic amino acid, which supplies beneficial glucose the body needs for energy. It is essential for proper cell growth and function and is also crucial to digestive health. Glycine makes up a large portion of collagen, which helps skin retain its elasticity and healing properties. Proline is used by the body to create new, healthy cells. This amino acid helps in the regeneration of skin and helps to reduce sagging, wrinkled skin. Also a proponent of collagen and cartilage, proline helps keep muscles and joints pliable. Serine is also derived from glycine. It is essential to brain function, particularly the chemicals that determine mood and mental stability. Serine, found in all cell membranes, also aids in muscle formation and immune health. Tyrosine is made from another amino acid called phenylalanine. It is a building block for several important brain chemicals called neurotransmitters, including epinephrine, norepinephrine, and dopamine.